This blog post contains a description of some of the standard substantive objections that a person may have to the admission of a Will to probate. Estate practitioners deem these objections the “four horsemen”. Due execution, testamentary capacity, undue influence and fraud comprise the four horsemen. Due execution is known as the Statute of Wills. The proponent of the Will must show by the fair preponderance of the evidence that the Will was signed at its physical end in the presence of at least two disinterested witnesses. At the time of execution, the person making the Will should make it known to the witnesses that he is signing his Will and wants the witnesses to act as witnesses. Due execution is assumed if an attorney supervised the Will execution “ceremony” and if the Will contains the legal attestation clause. Our firm is mindful of New York’s execution requirements and conducts the Will signings that it supervises in accordance with the statute. Testamentary capacity, the ability to make a Will, is broadly defined as every person over eighteen years of age who is of sound mind and memory. The Court will look to the testator’s capacity at the time that the Will was executed. Elements that the Court will consider include whether the testator understood the meaning of the Will’s provisions, the nature and extent of his property and the “natural objects of his bounty” (the identity of his family members or friends). Old age, dementia, and physical infirmaries such as blindness are not automatic disqualifiers depending upon the condition of the person when he signed his Will. Undue influence is when a person exerts such control over the testator that the testator changes the dispositions made in the Will to favor the controlling person. The objectant will need to prove that the perpetrator had the motive and opportunity to exercise undue influence, which was actually exercised over the testator. The Court may consider the issue of confidential relationships as proof of undue influence. Common types of confidential relationships include doctor-patient and clergy-congregant. Fraud is another objection. Was the testator tricked into making certain provisions in his Will based on the false statements of another person? Fraud must be shown by a higher standard of evidence, clear and convincing. The evidence must show that the perpetrator knowingly misrepresented a fact with the intent to deceive and that such acts caused injury to another. Confidential relationships will also be considered in fraud cases. The proponent of the Will may choose to enter a monetary settlement to resolve the claims of objectants or the probate proceeding may continue as any other litigation, pre-trial discovery and motion practice to be followed by a trial. 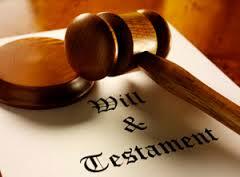 Our firm welcomes your inquires should you have questions as to the validity of a Will presented for probate.